Having grown up near San Francisco —which was recently reported to have the highest rent cost of any city in the world— I’m used to budgeting pretty tightly. Because of that, when I first came to Spain, I was counting my euros as carefully as I would have counted dollars back home. So imagine my surprise when on my first grocery run, my entire shopping cart (filled with food for the entire week!) cost only €20. That’s right: my grocery haul for an entire week costs me the same amount I could pay for a single meal in San Francisco. I fast realized how different the cost of living in Madrid would be compared to what I was used to in the US. Although not all expats in Madrid are from cities as expensive as San Francisco, it’s undeniable that for Americans, cost of living in Spain is pretty cheap. How cheap, you might ask? According to Expatistan’s cost of living calculator, it’s 27% more expensive to live in the United States than it is to live in Spain. If you want to get more specific and compare cities, San Francisco is a whopping 72% more expensive than Madrid, which is one of the priciest locations in all of España. Specific Expenses: How Much Does it Cost to Live in Madrid? So exactly how much should you expect to spend when you’re living in Spain? Here’s a brief rundown of the day-to-day costs you’ll need to consider if you are teaching in Madrid. Although I briefly studied abroad in Sevilla, it wasn’t until I moved to Madrid (and out of my host mother’s house) that I really got a sense of what life here costs. With that in mind, here are the 4 categories I generally use to allocate my budget. Some, as you’ll see, eat up a lot more of my paycheck than others. 1. Rent: How Expensive is Madrid? Here in Madrid, renting a room is like competing in the Olympics. Everyone’s going for the gold, and unless you’re the quickest and most persistent, you’ll probably have a hard time qualifying for the top spots. In all seriousness, the real estate situation here is a bit of a hassle. If you don’t plan ahead, you’ll have a hard time finding anything in city center that fits your budget. That being said, by American (or at least San Francisco) standards, room rentals here are actually fairly cheap. If you’re looking to live in the heart of the city, expect to pay anywhere from €350 to €600 for a room in a shared apartment. The farther you go from Sol, the more the average price drops. I pay about €400 a month, which seems to be a fairly standard metric. 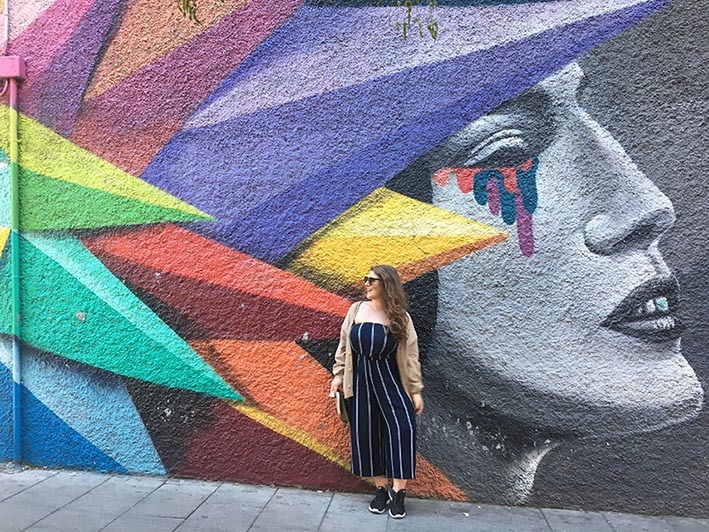 Having spent many an afternoon shopping along the streets of Gran Via or wandering into the little vintage stores in Malasaña, I’m well-versed in the pros and cons of clothes shopping in Spain. Sadly, there’s not much of a difference in price between the U.S. and Madrid when it comes to clothes shopping. Although some items are certainly more expensive back home, popular U.S. brands are also often marked up here. So: do your research before you shop! If you want that perfect pair of Levi’s, you might find it’s much cheaper to buy them back home. Food, on the other hand, is much less expensive here in Spain. I can honestly say grocery shopping has never been so easy. With an enormous variety of mercados (markets) and carnicerías (butchers) to choose from, I can honestly say I’m getting the best possible products at the lowest possible price. Example: often, I’ll pop by a grocery store on the way to Retiro park and buy a fresh baguette, local cheese, and chorizo for around €5. If that’s not living my best life, I’m not sure what is. In the United States, we often find ourselves working for the weekend. Here, the Spanish really have us beat: although Spaniards often work long days, they also treat socialization as a right, not just a privilege. So if you move to Spain, you can expect to drink a caña or two at least a couple times during the week. Luckily, beer here is incredibly cheap, even in Madrid, where the drinks are a bit more expensive. I will seldom pay more than €2.50 for a local beer, or a good glass of wine. If you’re more of a coffee drinker, you’re in luck, since a café con leche will usually only run you between €1 and €1.50. But don’t be fooled by the low prices! Spaniards are social creatures. So, although the drinks are cheap, you’ll probably be getting out much more frequently. Be mindful, or your budget will disappear just as quickly as those pints you’re drinking. Now that I’ve gotten you excited with talk of €2.00 wine, I feel like it’s my responsibility to deliver this reality check: yes, cost of living in Madrid and in Spain is significantly lower than in the U.S., but so is the average salary. Spain might be cheap for a quick visit, but once you’re living here, those low prices no longer seem like such a bargain. Still, with a little bit of budgeting, you’ll find the quality of life you get here is worthy. 11 responses on "Cost of Living in Madrid Compared to the US"
Although I’m from Canada, the same applies. It is much more affordable here. The cost of fresh, quality food still amazes me. It’s so cheap compared to home! And although rent prices are going up, compared to other European capitals they’re still a steal. I just spent two years living in Dublin and Madrid is miles cheaper in every aspect with a more laid-back vibe and higher quality of life. Really well-written article! It is so much more affordable here than in the US definitely. I agree with your point that the cost of living is based on salary as well. People here don’t make as much that is why it is so cheap. As long as I am only supporting myself and not a whole family my pay is quite great :). It sounds like living in Madrid is cheaper than living in the UK too!!! The cost of living in Murcia…even better! Decent places to stay for only 150 to 250 Euros, yup…unbelievable! Well it is expected I guess, since Murcia is a much smaller city.